Shopping centres in the Middle East and North Africa are among some of the most vibrant and successful retail environments throughout the world. Retail is all about change and adapting to the new trends and opportunities takes diligence, hard work and creativity. Pursuing growth in the retail industry enables expansion and prosperity. But to make these components work successfully you need to be up on the latest trends and best practices. RECon Middle East & North Africa enables our participants to learn. Understanding what you need to know now, and in the future, to operate successful businesses whether retailer, shopping centres owner, management team, service provider or retail professional . Jointly organized by the Middle East Council of Shopping Centres (MECSC) and the International Council of Shopping Centers (ICSC), RECon Middle East & North Africa 2018 will bring together shopping centre industry professionals, retailers, management and consulting companies, architects and design companies, entertainment and leisure companies, product and service providers to the industry, all under one roof for three days of networking, deal making and exploring new business opportunities. Shopping centres and the pastime of shopping in the Middle East and North Africa are lifestyles held in these recreational retail environments. These shopping centres are some of the most vibrant and successful in the world. Great brands, tremendous food choices, an array of entertainment and recreational options will never go out of fashion. Components to retail continue to grow only with hard work, diligence and by keeping attuned to the latest retail trends and best practices. 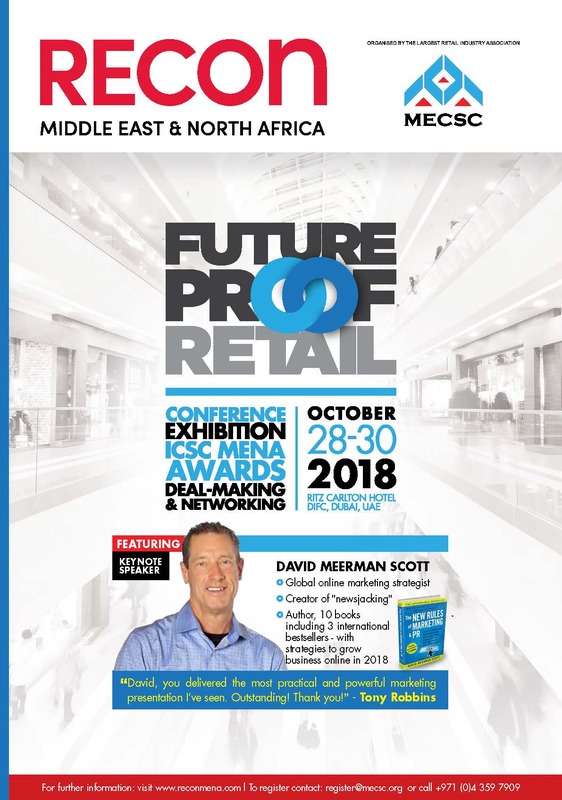 RECon Middle East North Africa will take participants to a new level of what you need to know now and in the future, to operate successful shopping centres. As retailers your ability to make great strides into accessing these markets is available in a once yearly conference in Dubai. ICSC in association with MECSC is pleased to announce the 6th edition of these prestigious awards that honors the best in the industry. ICSC Middle East and North Africa Shopping Centre Awards will be presented at RECon Middle East and North Africa in Dubai, United Arab Emirates for outstanding achievement in marketing, retail and design. Gold Winners of the ICSC Middle East and North Africa Shopping Centre Awards will be automatically submitted for the ICSC Best-of-the-Best Global “VIVA” (Vision, Innovation, Value, Achievement) Awards. 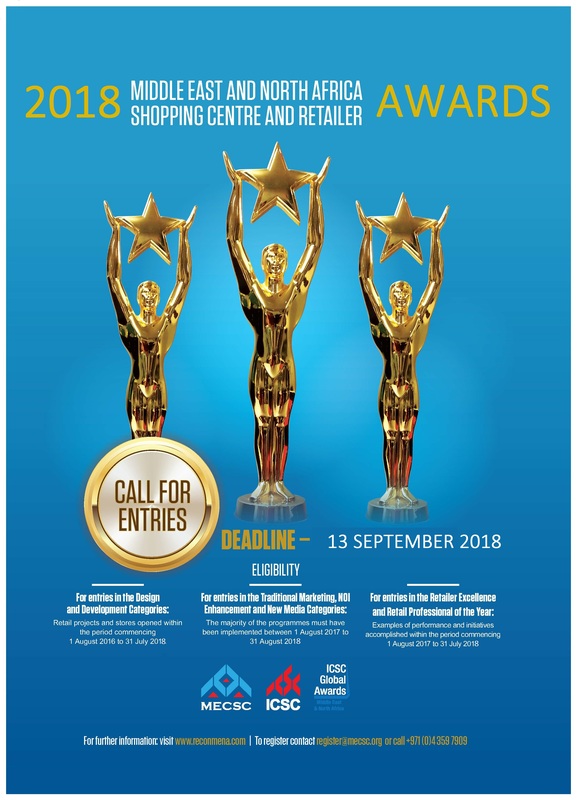 The Middle East and North Africa Shopping Centre Awards are a prime opportunity for shopping centre owners, retailers, developers, management companies, architects, designers and industry professionals to showcase their efforts in design, development and operation of their unique centres and award winning retail stores. Awards will be announced at a Gala dinner October 30, 2018. Please click here for the information on the Awards. Event Sponsors enjoyed showcase marketing in our exhibition area, representation in our RECon Conference Event Catalogue, web site, digital displays, display boards, speaking opportunities and recognition in our Shopping Centre Awards Gala and Education Conference. The best and the brightest minds from the retail industry around the world are in Dubai for our RECon Conference. Your ability to put your name and brand forward to those individuals making the corporate business decisions is what you can expect from being a sponsor of RECon. We offer a discount of AED 367 (USD 100) per delegate off the applicable registration fee when three or more delegates register at the same time from the same organization and from the same billing source. *Non members can apply for MECSC/ICSC membership and can take advantage of the applicable member rate prior to registration. To register as a member, please click here .